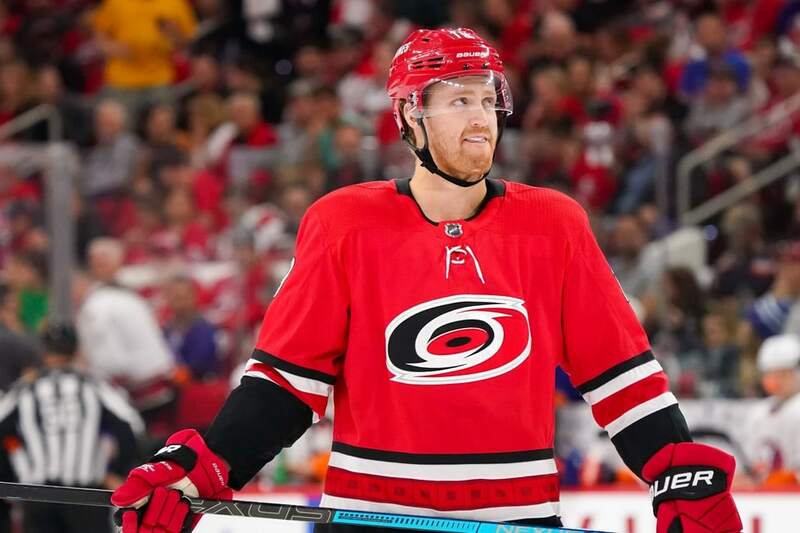 Former Hurricane, Elias Lindholm, left the PNC Arena ice after Calgary’s 4-3 win yesterday mocking the Hurricanes team celebration (celly). ‘Canes social media felt offended, betrayed, and that it was classless. I’m here to tell you that Lindholm was well within his right to do that. Here’s the thing. In the moment, I scoffed at him and Flames goalie David Rittich clapping post-game. It took me about half a second to realize he and Lindholm likely planned this from the start, and then I wasn’t frustrated anymore. It was made sweeter for him and more painful for us because of the fact that Lindholm felt back-stabbed by an arena full of fans that decided to boo him. WHY did the fans boo him? I honestly couldn’t believe my ears. It was unbelievably tone deaf. That is specifically why Lindholm was so enthusiastic about trolling our team celly. The irony in acting classless towards a former player who never clearly did anything wrong, but then getting upset when said player reciprocates is just hilarious to me. Being a team that celebrates wins like we do, we have to expect other teams will mock us. I enjoy them and think they’re fun, but we’re going to get mocked, and that’s okay. Regarding Lindholm, the only thing he never quite did was live up to his 5th overall draft stock. Based on the other players around him at the time –not named Jeff Skinner–, I don’t blame him. He was interested in staying a Hurricane into this season and beyond, but management decided he wasn’t worth the money, so they traded him. I wanted him to stay, and it’s a shame to me because this amazing season he’s having in Calgary is unsurprising. In my eyes, Lindholm always had the tools of a strong, two-way play-making forward. Not to mention, he was a right-handed forward, something the team currently lacks. However, the front office had a different assessment. With the trade deadline exactly three weeks from yesterday, we’re going to see an influx of trade propositions and scouting reports from fans and experts alike. What goes into assessing a team’s assets though? Then, how does that value determine the organization’s course of action surrounding the trade deadline? For the Hurricanes, the result of this upcoming 5-game road trip will answer that question. There are a lot of teams around the league interested in our slew of right-handed defensemen. Three in particular, Faulk, Hamilton, and Pesce, could be dealt. If I had my pick, Justin Faulk is the one I would like to see us let go of. He’s been largely inconsistent for us over the years. I’ve supported him, I’ve bashed him, but right now, I’m just lukewarm towards him. Regardless of my personal feelings, he is still a good NHL defenseman that would assist every defensive group in the league. His calling card is his one-timer from the point as well as his above average puck handling in transition and the offensive zone. I don’t think he’s a power play quarterback, but don’t tell the ‘Canes coaching staff that. They’re still convinced he is. The knock on Faulk is that his defensive zone awareness is lacking at times. His effort when things aren’t going well has also been called into question. The good news is that trade interest in Faulk has reportedly gone up recently. This is because he’s reasonably priced, has a year left on his contract, and could be had for relatively cheap. In my opinion, if someone offers a middle-rounds draft pick (a 3rd or 4th) and a mid-tier prospect for Faulk, you make that deal. It’s a lower return compared to what Hamilton or Pesce could land us, but we need to make room for Adam Fox, our NHL-ready prospect who is finishing up his season at Harvard. Dougie Hamilton is one that I’m not sure how I feel about moving forward. He’s certainly elevated his game in the second half of the season, like he habitually does, and that adds to his value. Hamilton is a big guy; he’s essentially a larger Justin Faulk in terms of play style, except that he has an even more threatening shot. His desire to get the puck towards the net at every opportunity sees him creating lots of scoring chances whether they’re for himself or his teammates. Hamilton would bolster any NHL team’s blue line, but I’m hopeful that Toronto is still trying to add a right-handed defenseman. I’d take Kasperi Kapanen off their hands in an instant. The problem with this is that Toronto would never agree to that one-for-one deal. Kyle Dubas, the Toronto general manager, is not Minnesota general manager, Paul Fenton. The Hurricanes would undoubtedly have to add Hamilton into a package. Hamilton is a guy I like on the Hurricanes. I think that when he’s going he’s a great asset. However, if Hamilton plus a pick or prospect can land us a top-6, preferably right-handed forward, I’m listening to offers. I can’t imagine a scenario in which trading Brett Pesce makes the Carolina Hurricanes a better team than they currently are. It’s just my opinion, but Pesce should be considered untouchable and the type of player you build a defensive core around. I’m high on Pesce because he’s already proven his value by playing against the NHL’s best, yet he continues to grow. Pesce is a rock-solid defenseman with great own-end awareness and superb hockey IQ. He is patient with the puck, makes the simple play, and is always in the right place. I think the most exciting part of Pesce’s game is that you can see his confidence in the offensive zone growing. In the game against Vegas, he made a great read and jumped on a loose puck in the slot and tucked it for his fourth goal of the season. I’ve noticed him starting pinching down the wall to keep a play alive when he deems it safe, and I’ve noticed him calling for the puck in one-timing situations more. He’s extremely valuable to this team’s success. We’ll lose more games than we win if we trade him, no matter which top 6 forward comes back to us. Pesce is the ideal player that teams would target. He’s got term, and he’s got a great price tag for his near-elite skill set. If one of those teams is Toronto (and one is), he could feasibly fetch Kapanen in a one-for-one deal. He might even be able to land William Nylander if we structure the deal a little differently. Though, Toronto went to extremes to re-sign Nylander, and I prefer Kapanen. Regardless of those “ifs,” I want to keep Pesce because he has all the tools to help Carolina compete now and going forward. In my opinion, our need for right-handed forwards does not outweigh the benefit in keeping Pesce. It’s worth noting that Hurricanes have a large group of right-shot forward prospects currently playing for the Charlotte Checkers. That list includes Martin Necas, Andrew Poturalski, Julien Gauthier, Nicholas Roy, Morgan Geekie, and others. Help could be on the way in that area, so if we think two or three of those guys have a legitimate chance in the NHL, it would be best to sit tight. Buckle up because this road trip beginning tonight in Pittsburgh and the subsequent trade deadline are going to be a doozy for the ‘Canes.